If you’re looking for a budget-friendly fish finder that is easy to install, accurate in both profound and shallow water, then you may want to look at the Garmin Striker 4 Fish Finder. 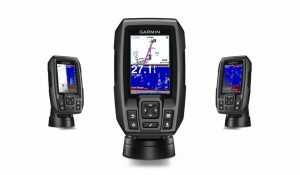 Garmin has turned the whole fishing world upside down with this fish finder. The Striker 4 has introduced a high image resolution to give you a clear picture of what is directly under your boat. It offers a lot of premium features you can rarely find in other entry-level fish finders. The Garmin Striker 4 is an amazing device that can help you catch more fish and offers smooth scaling uninterrupted imagery when moving between deep and shallow waters. The Striker 4 comes with a waterproof rating of IPX7. That means it can withstand immersion in water up to 1 meter for up to 30 minutes. It is not suitable for high-speed watersports though. It also comes with a GPS for docks and hot spots so that you can find your way around the river. The Striker 4 also features a CHIRP Sonar transducer that gives the device the cleanest and smoothest water flow for getting the best image. It also can show you the water temperature and boat speed. Yes, this fish finder is built to deliver high-tech Chirp technology at a decent price point. We have positioned the Garmin Striker 4 as the prime choice for budget fish finders. The Striker sells at a little over hundred bucks, making it an excellent entry price and the best bang for your buck around. Its price and effectiveness made us select it in the list of top five fish finders here. The design of this fish finder is captivating and brilliant. The Garmin Striker features a portable design which comes in handy, especially when you’re on a smaller boat. The clearly marked buttons make getting around the functions of the unit easy and very intuitive. The keypads are big enough for you to control and use, even if you’re wearing gloves. What convinced us that the Garmin Striker 4 is the ideal fishfinder for anglers is its outstanding performance. This fish finder offers a Power RMS that gives the device the ability to go down deep in both fresh and salt water. The Power RMS is capable of giving you sharper and accurate pictures. Also, the Garmin offers you with different modes. The Traditional mode shows you the bottom structure of obstacles in the water, such as arcs that represent fishes. The second mode is called the Flasher mode. What it does is to show the different depth levels and integrates two Sonars or fish finders into one. The third mode is the Split Frequency where you can have 200 hundred kilohertz and 70-kilohertz side by side. With this mode, you can see the narrow segment on one side and the wide segment on the other side. This mode shows you what is under the boat in two different cones. The fourth mode is the Waypoint Map, which allows you to view and navigate through the position you have marked. You can also use it to find your way back to that particular spot. Also, do keep in mind that this unit can save up to 5000 waypoints which are very useful. The fifth mode is the Waypoints map and the Sonar screen. You can change the map into vertical and horizontal splits using the layout configuration while the sixth mode is the Section Number that shows you GPS speed coordinates. What ultimately tipped me over this device is the screen that lets you see if you’re trolling at the right speed. Even if you don’t have any electronic experience, you can comfortably find your way around within a few minutes. The image quality of this fish finder is crisp and clear. 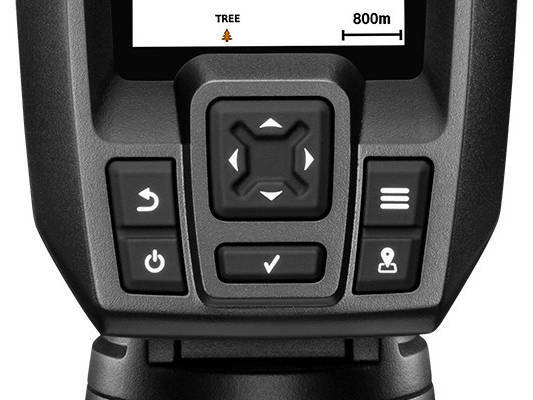 The Striker uses a touchscreen and offers a few dedicated buttons for easy navigation. More importantly is the clear screen size of 3.5-inch which delivers a 200 kilohertz reading for a sharper image. The Striker also comes with a 77 kilohertz reading for a dull image. So that means, if you decide to use the 77-kilohertz image quality, you’re going to get a duller image, but a larger scanning area. Personally, I like the higher kilohertz because it gives me a sharper image even though I don’t get larger scanning areas like that of the 77 kilohertz. 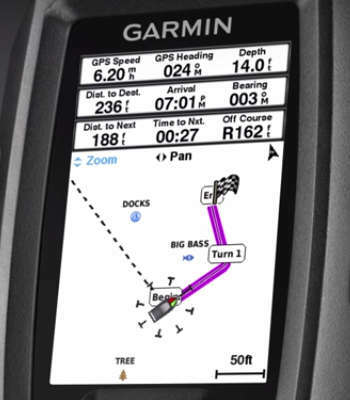 With all the included hardware and cables, Garmin gives you much clearer and sharper view of fish targets. The GPS capabilities of this device work amazingly and accurately. It gives you a clear picture and allows you to mark your favorite spots like drop-offs, weed beds, rock piles, and underwater structure. So when you spot fish, you can mark the location using the GPS. Another groundbreaking feature is the Chirp technology that sends sweeps of frequency underwater and interprets detail results from all of them. The technology comes in handy in delivering a visible level of clarity for better fishing with greater target separation and structure. You will be able to see a school of fish or a couple of medium fishes or a huge fish. The best part is that the Sonar comes complete with a mount and a transducer which makes it very easy to install. The transducer cable is waterproof, which means it isn’t going to be affected by water. Also, do keep in mind that you can either mount the chirp transducer on the transom of your boat or on your trolling motor. The battery proved to be pretty much outstanding in every area of our test. The fish finder offers a 12 volt, 7 milliamps of battery life and a charger to power up the battery. The device has an indicator light that shows you when it is charging. During our test, we found out that the battery life is quite reliable. In our fishing trip, it was able to carry us through for about three days without any issues at all. If you’re looking for a portable fish finder for your boat, then I’d recommend the Garmin Striker 4 Fish Finder. It is user-friendly and has everything you’d need in a fish finder. Having a unit that features a GPS capability and also the ability to save your waypoints is tremendously a big plus. Striker 4 is an amazing little device that comes with a very friendly price point. The premium features and functionality it offers are completely unmatched by any other fish finders on the market. You can hardly find any fishfinder that offers all these features at a low price. The fact this device provides a Sonar Chirp technology that delivers a much higher definition and better target separation of underwater structure makes Garmin Striker 4 fish finder an excellent choice for anglers. You can purchase Garmin Striker 4 here on Amazon. This product works great. It came with everything I needed. It was easy to install and easy to read even in direct sunlight. Nothing fancy but it does a lot for the money spent. I have had many different types over the years, but this is the best one yet for the price! Couldn’t be happier! Nice Review and well explained. What do you think? What is your recommendation between the Garmin Striker 4 and Hummingbird Helix 5. If you think about the budget, one would want to go with the striker 4. But I am looking for something that is more worthwhile than just price. I also observe that you content does not have a link to Amazon’s website in case I’d like to view the product. Hummingbird’s Helix 5 is definitely better than Garmin’s Striker 4. Here’s the complete review of the Helix 5. We’ll be adding Amazon links soon. No specific reason for that. Where do you get more wire clamps? I haven’t got to use it yet but i bolted it up to my kayak w/ a swingout arm for the transducer. Absolutely amazing device (5 STARS ALL DAY) and I haven’t even out it on the wayer yet. Haha. Yeah, wonderful product. Hey guys , here’s the deal, haven’t got to use it yet but i bolted it up to my kayak w/ a swingout arm for the transducer. Absolutely amazing device (5 STARS ALL DAY) and I haven’t even out it on the wayer yet. Haha. Yeah, wonderful product.